f. the relation between occurring and possible words formed with a certain WFR. Bauer (2003) mainly concerns himself with definitions c. to e., namely to which degree a morphological pattern (i. e. what was above referred to as a word formation rule) is available to be used in creating new words, not how much it is actually used. According to him, this can be determined by looking at the number of cases available for applying the pattern, the number of (absolute or relative) constraints when applying the pattern, and the usefulness of the word formations that it can create. Yet in either case, and in all the definitions given, the focus lies on either the output side of word formation or on the restrictions of a specific morphological pattern. These restrictions may lie in the input (e. g. certain patterns only being applied to the input of specific characteristics like for example a certain phonetic shape) but the meaning of the input itself has not been studied much so far, although it is clear that word formation would not be possible without it. When investigating the semantics underlying word formation processes, the general question from the perspective of the meaning of the input could be stated as follows: Independent of any specific kind of word formation pattern, are there morphemes that appear more commonly as bases of word formation than others, and if so, what do they have in common? In contrast to classical research on word formation, which often investigates potential word formations, this question can probably best be studied by investigating existing word formation patterns, that is, by asking how often one morpheme occurs in how many words (considering the whole lexicon of a given language, or a certain section of it). Shifting the focus from the forms to the concepts would also facilitate cross-linguistic comparison, especially if one starts from basic concepts, like the ones traditionally used in fieldwork and lexical studies on historical language comparison (compare the Concepticon resource, https://concepticon.clld.org, for an overview, List et al. 2016). Such research would, of course, not assume that concepts are the same across languages, but rather employ the idea of using comparative concepts in the sense of Haspelmath (2010:668). Given that – to my knowledge – a systematic investigation of the “semantic productivity” of concepts across languages has not been carried out so far, we can only speculate why – if at all – some words expressing specific concepts would recur more frequently as the base of new words than others. Provided that we can identify cross-linguistic trends, the Embodiment theory, according to which language is shaped by our physical characteristics, might provide an explanation. As one of the few studies devoted to the topic, Geisler (2018) demonstrates for German that some of the morphemes denoting concepts most deeply rooted in our early childhood experience (such as “to stand” or “to fall”), seem to be used extremely frequently in derivation for a large variety of meanings derived from the conceptual base. We can clearly see that Blank’s term expansion describes the process underlying the phenomenon for which we do not yet have a name. However, as Blank states himself, expansion is based on a semasiological perspective: A specific word is gaining a new meaning additionally to those it already had. Yet the phenomenon we discussed so far focuses on an onomasiological approach that investigates how concepts contribute to semantic expansions of the words denoting them. Furthermore, expansion refers to a concrete process, situated in a specific language and time frame, whereas our starting point was – among others – the question of whether and to which degree universal tendencies could be encountered when comparing the “expansivity” of concepts across the world’s languages. Both expansion and what we are referring to here form counterparts to Blank’s term attraction. Attraction means that a concept attracts new words or word formations denoting it. If, on the other hand, a word’s meaning expands, it can be used to coin new words, which – in turn – would be expected to denote “attractive” concepts. To form a wide range of new words, words first need to expand their meaning, which itself is also based mainly on the meanings the words already have. While meaning expansion can happen to any word independent of its previous meanings, we here propose that some meanings might have a stronger tendency to undergo this expansion. After longer discussions in our project, during which we tested many different terms as candidates to denote that some morphemes may be more important for word formation due to their semantics, we decided to take inspiration from microbiological terminology and use the term promiscuity. Investigating the promiscuity of concepts, be it cross-linguistically or within one language, would thus entail that we investigate to what degree word formation is driven by the semantics of the words or morphemes being recycled to form new words. Given that biology and linguistics often share terminology and metaphors (List et al. 2016a), we can also find examples in linguistics, where promiscuity is used as a term, albeit it is less widespread and mainly used in a quite restricted sense. Zwicky (1987:136), for example, speaks of “promiscuous attachment” by which he means the “attachment to i[nflected]-forms of virtually any syntactic category” (he also uses the term “promiscuity” in Zwicky 1986 and talks about the same concept without having a term for it in Zwicky and Pullum 1983). Similarly, Haspelmath (2018:315) uses “promiscuous” for bound forms that attach to more than one word class. In his definition, promiscuous morphemes form thus a category between affixes and roots. In a slightly different approach, Zólyomi et al. (2017:21) use “promiscuous” to refer to the mixing of cases, i. e. cases extending their usage to functions previously inhabited by other cases. However, they write this in the context of second language learners and not of ‘normal’ language change, and apparently do not intend to use it as a technical term. What all these uses of the term have in common is that they talk about the openness of something to connect to a variety of different kinds of other things, a meaning that is clearly based on the term’s more colloquial usage. The semantic promiscuity proposed here (called such to differentiate it from the more syntactic or grammatical concept by Zwicky and Haspelmath) could first be said to differ from that original meaning by being concerned with the type-frequency of a morpheme in general, independent of its choice of word formation pattern or, e. g., of the grammatical variety of other morphemes it connects to. However, while semantic promiscuity, unlike its grammatical counterpart, is not referring to concepts being less restricted in the grammatical aspects of the bases they can take, it nevertheless refers to something similar, namely that morphemes denoting promiscuous concepts are less restricted regarding the semantics of the morphemes they attach to in word formation and the semantics of the new words formed thereby, either by being already polysemous themselves, or by being more open to develop polysemy, i. e. to undergo semantic expansion. 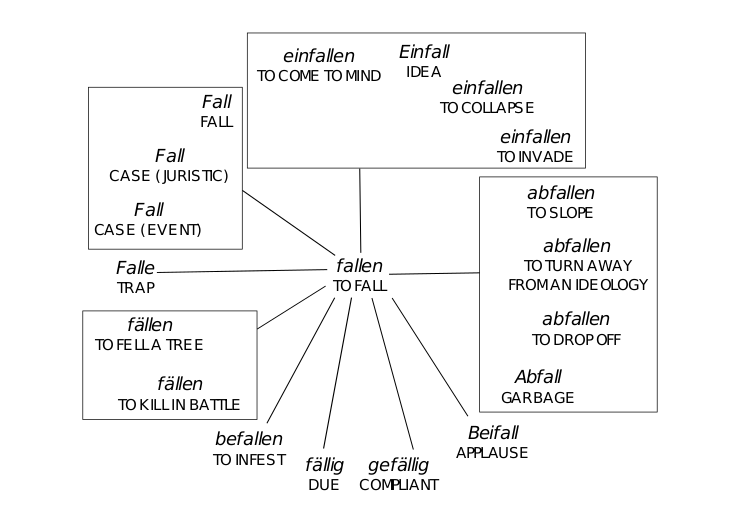 Figure 1: The concept ‘to fall’, denoted by German fallen, showing its high promiscuity in a selection of the wide range of meanings derived from it. This includes the expansion of meanings of existing word formations, here marked by grouping together derivations sharing the same stem. An example of how promiscuity and expansion interact can be seen in Figure 1 above. Having provided this preliminary description of what it is we are talking (or want to talk) about, the next step will be to actually investigate it cross-linguistically. Bauer, Laurie. 2003. Morphological Productivity. Cambridge: Cambridge University Press. Blank, Andreas. 1997. Prinzipien des lexikalischen Bedeutungswandels am Beispiel der romanischen Sprachen. Beihefte zur Zeitschrift für romanische Philologie 285. Tübingen: Niemeyer. Gaeta, Livio, and Davide Ricca. 2015. “Productivity.” In Word-Formation: An International Handbook of the Languages of Europe, edited by Peter O. Müller, Ingeborg Ohnheiser, Susan Olsen, and Franz Rainer, 22:842–858. Handbücher zur Sprach- und Kommunikationswissenschaft 2. Berlin;New York: De Gruyter Mouton. Geisler, Hans. 2018. “Sind Unsere Wörter von Sinnen? Überlegungen zu den sensomotorischen Grundlagen der Begriffsbildung.” In Worte über Wörter. Festschrift zu Ehren von Elke Ronneberger-Sibold, edited by Kerstin Kazzazi, Karin Luttermann, Sabine Wahl, and Thomas A. Fritz, 131–142. Tübingen: Stauffenburg. Haspelmath, Martin. 2010. “Comparative Concepts and Descriptive Categories in Crosslinguistic Studies.” Language: A Journal of the Linguistic Society of America, no. 86, 3: 663–687. List, Johann-Mattis, Michael Cysouw, Simon Greenhill, and Robert Forkel, eds. 2018. Concepticon. Jena: Max Planck Institute for the Science of Human History. http://concepticon.clld.org/. List, Johann-Mattis, Michael Cysouw, and Robert Forkel. 2016. “Concepticon. A Resource for the Linking of Concept Lists.” In Proceedings of the Tenth International Conference on Language Resources and Evaluation, edited by Nicoletta Calzolari, Khalid Choukri, Thierry Declerck, Marko Grobelnik, Bente Maegaard, Joseph Mariani, Asuncion Moreno, Jan Odijk, and Stelios Piperidis, 2393–2400. Portorož: European Language Resources Association. List, Johann-Mattis, Jananan Sylvestre Pathmanathan, Philippe Lopez, and Eric Bapteste. 2016. “Unity and Disunity in Evolutionary Sciences: Process-Based Analogies Open Common Research Avenues for Biology and Linguistics.” Biology Direct. OED Online. July 2018. Oxford University Press. http://www.oed.com/view/Entry/152428?redirectedFrom=promiscuity (accessed November 16, 2018). Rainer, Franz. 1987. “Grammatik und Wortbildung romanischer Sprachen.” In Produktivitätsbegriffe in der Wortbildungslehre, edited by Wolf Dietrich, Hans-Martin Gauger, and Horst Geckeler, 187–202. Tübingen: Narr. Sperber, Hans. 1923. Einführung in die Bedeutungslehre. Bonn; Leipzig: Schroeder. Zólyomi, Gábor, Szilvia Jáka-Sövegjártó, and Melinda Hagymássy. 2017. An Introduction to the Grammar of Sumerian. Budapest: Eötvös University Press. Zwicky, Arnold M. 1986. “Incorporating the Insight of Autolexical Syntax.” OSU Working Papers in Linguistics 32: 139–143. Zwicky, Arnold M. 1987. “Suppressing the Zs.” Journal of Linguistics 23 (1): 133–148. http://www.jstor.org/stable/4175870. Zwicky, Arnold M., and Geoffrey K. Pullum. 1983. “Clitization vs. Inflection: English N’T.” Language 59 (3): 502–513. Cite this article as: Nathanael E. Schweikhard, "Semantic promiscuity as a factor of productivity in word formation," in Computer-Assisted Language Comparison in Practice, 19/11/2018, https://calc.hypotheses.org/1169.